8 Cent Mac 'n' Cheese! Attention cheese-loving New Yorkers: this Tuesday (7/29), Supermac is teaming up with 8Coupons.com to offer 8-cent mac and cheeses, available all day. 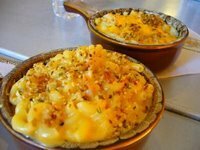 Supermac is a mac and cheese mecca here in New York City, offering no fewer than 13 different varieties of the dish. I've never been to Supermac (and I call myself a Curd Nerd? ), though I have been a few times to their very similar downtown competitor S'Mac, which is a great restaurant itself. But it's pretty tough to resist 8-cent mac and cheese, so I'm definitely going to go try it. The website that's co-sponsoring the event seems interesting too; the premise is that you can text-message coupons to your cell phone, and redeem them at stores simply by showing the cashier the text on your phone. Pretty cool idea, and I downloaded a bunch of other coupons for a kosher deli near my office. I'll be sure to give a full review of Supermac's offerings in the comments below. Check back on Wednesday!